Himachal Pradesh Common Entrance Test is largely surfed as HPCET 2018 which is conducted yearly by the Himachal Pradesh Technical University to grant admissions in Engineering Programs to various institutes located in state of Himachal Pradesh. The B.Tech seats in various colleges of Himachal Pradesh state are offering to the students on the basis of JEE main 2018 or HPCET . The admission to all courses will be on the basis of merit or rank/marks obtained in the National Level Entrance Test subject to fulfilment of minimum educational qualification. However after exhausting the merit of National Level Entrance Test, the admission to all the courses will be done on the basis of the marks obtained in HPCET 2018. The applicants must have passed his/her 12th grade from a recognized Board or University. Physics and Mathematics must have been the compulsory subjects in the qualifying exam, along with either Chemistry or Biotechnology or Biology as the optional subject. The applicants must have scored a minimum aggregate of 45% (40% in case for reserved category candidates) in the above subjects. Application Form filling for HP CET 2018 will start from End-February to Mid-May 2018. The exam will be conducted in the offline mode. The HPCET 2018 exam paper will be in the English language. 2 marks will be awarded for each correct answer and ½ marks will be deducted for each incorrect answer. Kinematics, Laws of motion, Work, power, energy, Motion of centre of mass, connected systems, Friction, Gravitation, Bulk properties of matter, Viscosity, Heat & Thermal Physics, Thermodynamics ,Physical World, Measurements, Units & dimensions, Kinetic theory of gases, Oscillations & Waves, Electrostatics, Current Electricity, Magnetic effect of current, Magnetics, Electromagnetic induction & alternating current, Electromagnetic waves, Optics I (Ray optics),Optics II (Wave Optics),Particle nature of light & wave particle dualism, Atomic Physics, Nuclear Physics, Solid state Electronics. The Periodic Table and Chemical Families, Chemical Bonding and Molecular Structure, Coordination Compounds, Solid State, Liquid State, Atoms, Molecules and Chemical Arithmetic, Atomic Structure, Radioactivity and Nuclear Chemistry, Gaseous State, Chemical Energetics and Chemical Dynamics, Physical Chemistry of Solutions, Ionic and Redox Equilibria, Hydrogen, Chemistry of Non-Metallic Elements and their Compounds, Chemistry of Metals, Chemistry in Industry, Polymers, Surface Chemistry, Environmental Chemistry, Chemistry of Carbon Compounds, Aliphatic Compounds, Haloalkanes and Haloarenes, Alcohols, Ethers, Aldehydes and Ketones, Carboxylic Acids, Aliphatic Amines. The e-Admit card duly signed by Controller of Examination (hereinafter referred as COE) will be made available for candidates on the University website i.e. www.himtu.ac.in. Candidate should enter the Application Form number to download the e- Admit card. The e-Admit card will indicate the name of applicant, father‘s name, photograph of the student, address of the test centre, test date, etc. Discrepancies, if any, must be brought to the notice of the Controller of Examinations, H.P. Technical University, Gandhi Chowk, Hamirpur -177001 (H.P.) immediately. Candidate should report to the allotted test centre along-with e-Admit card and ID proof, half an hour before commencement of the examination. 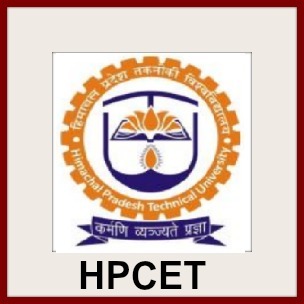 HPCET result will be declared by HIMTU on May 2018. To check their result of HPCET 2018, the candidates have to enter their HPCET 2018 roll number and name. Candidates' score/marks in HPCET 2018 will determine their admissions to various undergraduate engineering courses across the participating institute in the state of Himachal Pradesh. HPCET 2018 Merit List will be published by Himachal Pradesh Technical University (HIMTU) in second week of June, 2018. Engineering colleges of the state will accept the score of candidate in JEE Main 2018 and HPCET 2018. HIMTU will prepare a separate merit list for candidates who have opted for admission through JEE Main. Candidates who have qualified JEE Main 2018 or HPCET 2018 will only be allowed to participate in the counselling. HPCET 2017 Counselling will be conducted by Himachal Pradesh Technical University (HIMTU). During the counselling, 50% of total seats will be allotted through JEE Main 2018 Merit List and rest 50% will be allotted through HPCET 2018 Merit List.